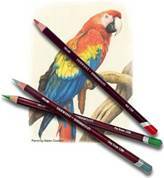 Derwent Artists Pencils are a slightly waxy, permanent coloured pencil. 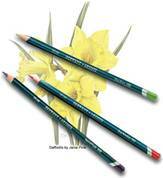 The Polychromos Colour Pencil from Faber Castell is one of the nicest permanent colour pencils around. 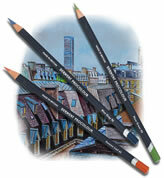 With a thick, oil based lead it is water resistant and smudgeproof. 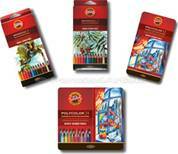 The Lyra Rembrandt Polycolor Pencils are top quality colour pencils which come in 78 colours. 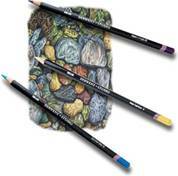 Their brilliance, light and water resistance and the particular smoothness of the leads meets the highest demands of all artists. 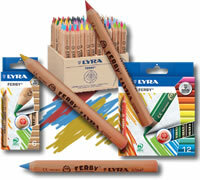 Lyra Color Giant Colour Pencils have the same beautiful, 6.5mm thick, highly pigmented cores as the Ferby & Super Ferby ranges, with a nice, chunky, hexagonal barrel which feels pleasantly weighty in the hand. The brilliant Lyra Groove is ergonomically shaped and includes natural grip in the shape of offset grooves to encourage a proper grip. 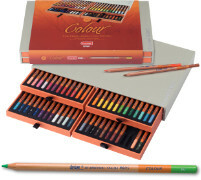 With Lyra's usual excellent pigments and soft leads they are perfect for little hands or people who have gripping issues. 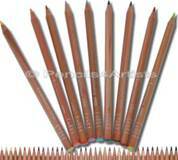 Available in colour pencils or graphite. 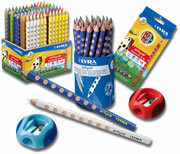 The Lyra Ferby & Super Ferby Colour Pencils have long been accepted as one of the best pencils around for all artists and especially children, left handers and people who have problems with gripping.